One man’s trash is another man’s treasure. Especially if they’re willing to take that trash and turn it into one of the slickest custom-made guitars I’ve ever seen. Reddit user sjoe was recently inspired to take a very old, and very broken guitar and transform it into a gorgeous, Fallout-themed Nuka Cola Quantum axe. I would very much like to order five of them just for myself, to be honest. sjoe described the guitar in its previous state as a “cheap, entry level” thing that looked like it might well have been used as a paddle at one time. 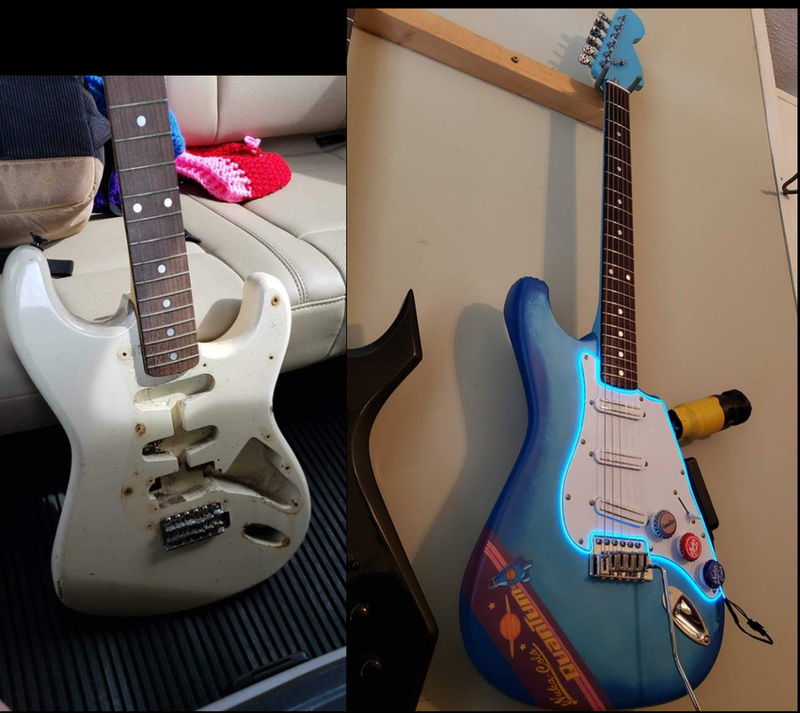 It always hurts to think about a poor innocent guitar being abused, so I’m happy this one found a stylish new life with sjoe. The end result is genuinely incredible, and packed with awesome little details. I’m especially impressed by the Nuka Cola bottle caps acting as the knobs, as well as the moody glow behind the scratchplate, which was apparently achieved by using a fiber optic strand you can cut to length, along with a AA power source (the black box on the side). 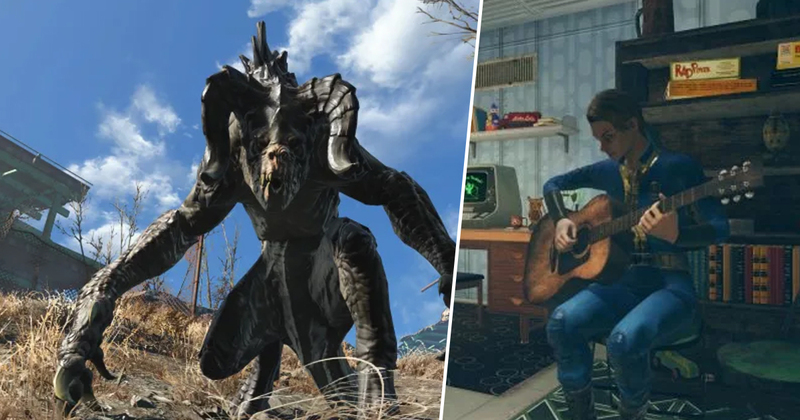 As sjoe explained on the Reddit thread, they intially decided to take the guitar apart for kicks, settling on a theme before deciding to “mangle” it for the fusion core. It even plays pretty well, apparently. I struggled with intonation on the bridge at first but got it worked out. The neck was surprisingly straight even though its obviously been wet, and the truss rod seemed to be in good shape. While I probably wont play this one a lot, the triple rails gives me a pretty good range of tonal variations. I’d put it up against one of my $500 rigs. Not bad considering I paid 30 bucks for it originally and only put maybe 150 into it, and a bunch of hours. Incredibly, sjoe is a “bit of a newb” when it comes to paint, in their own words. I can honestly say I’d never have considered they were a beginner in any sense based on the gorgeous work they’ve done here.